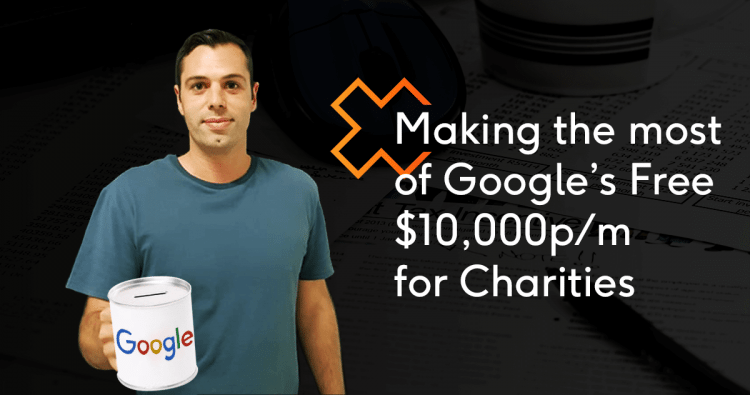 Recently, Google has made some major changes to how to how their grants program for not-for-profits works – and it’s a major win for charities wanting to make full use of the $10,000USD per month Google is offering! You see, most charities are registered and using the Google Ad Grants program – however, very few are making full use of the spend they have available. And often, the small % of the grant they are spending can sometimes be on irrelevant clicks that aren’t driving donations. The recent changes to the program will make it a lot harder for charities to manage their own accounts, as we’ll discuss soon with Google’s new performance requirements. But, they will also give charities much more potential to compete for the right terms, by getting rid of the maximum $2 per click that held a lot of not-for-profit campaigns back previously. Previous to this update, accounts using the Google Grants program were restricted to a maximum bid limit of $2 – which made it hard to compete against accounts not restricted by this bid limit. However, Google has removed this limit for any campaign using the ‘Maximise conversions’ bidding strategy. Huge win! The second major change is that accounts will need to keep a Click Through Rate (CTR) above 5%. If the CTR of an account falls below 5% for 2 consecutive months, the account can be suspended. This can be pretty scary for any not-for-profits running their own accounts. Keeping a CTR above 5% is not impossible, but it means that ads will need to be super targeted to the search queries they’re showing for. If account structure and ad copy aren’t spot on – it could be hard to keep the CTR above the required 5%. As long as the account is structured well, ad copy is good and targeted keywords are relevant – the 5% CTR shouldn’t be too much of a problem. Ensuring you’re targeting the right terms, and the ad copy speaks to the intent of the search query the ad is showing for is key. Since the changes came out, we’re seeing some of our clients able to increase spend drastically. Some clients are doubling their previous spend and more. However, those not-for-profits who are not experienced in managing AdWords accounts may be left behind as others make the most of these new changes. Now more than ever it’s definitely worth not-for-profits enlisting the help of an AdWords agency who can help make the most of Google’s $10,000USD available to spend each month. If you’ve received a notification that your account is going to be suspended because of a low CTR or if you would like to speak to one of our consultants about how you could improve your campaign, feel free to get a free consult or get in touch.